SFGAmWorld • View topic - V2's Last Year? I think now seeing how Joker is sitting when approaching Mardi Gras, one can't see V2 very well anymore. Perhaps it is indeed on its way out. Not only that, but the way the path has been redirected over there seems to work with the park's future plans. It's been said that there are pink markers throughout the Picnic Grove. WolfRaging95 wrote: I think now seeing how Joker is sitting when approaching Mardi Gras, one can't see V2 very well anymore. Perhaps it is indeed on its way out. Not only that, but the way the path has been redirected over there seems to work with the park's future plans. It's been said that there are pink markers throughout the Picnic Grove. Interesting. I personally don't think it will leave. How many livable years do the flumes have left as taking out V2 alone isn't a lot of viable space to work with if the park is looking to put something in of decent size. I really love v2 in our park. My dream is that if they wanted to use that space V2 sits on, they would rehab/repaint it & relocate it somewhere else in the park. gottastrata33 wrote: I really love v2 in our park. My dream is that if they wanted to use that space V2 sits on, they would rehab/repaint it & relocate it somewhere else in the park. Agreed 100% I understand that the Flumes and V2 take up a huge amount of space that could be used for a large coaster, but at the same time, I really love V2 and would rather see them move it else where within the park instead of shipping it off to a smaller Six Flags Park! After seeing what happened with Iron Wolf and Ragin' Cagun, and knowing how Six Flags works, I suspect that if we were getting something big enough to NEED that space, it would also be big enough to require us to give something to another park. I would just like to remind everyone exactly what V2 is and how many unique things it does compared to our other coasters. It is a launched, inverted, vertical shuttle coaster with 3 launches, the first being 0-60 in 3.5-4 seconds which is nothing to sneeze at. While Batman is also inverted and Superman achieves more sustained g force in the pretzel loop, no other coaster in the park, nor within a 200 mile radius, achieves anything else that V2 does in terms of elements. Just looking at the pitch/pull up to the vertical spires, those must be damn near the shortest radius of curvature, most extreme pull ups featured on nearly any coaster, and the contrast between the strong launch, strong vertical g force of the pull ups, and zero g free fall is a great experience. I will be quite disappointed if they removed V2 without an immediate 70+ mph launch coaster replacement. But there may be hope, as combined with the removal of the flumes and possibly rapids, that frees up not only land but also staff and resources for a massive coaster, and one I think that will be more along the lines of an S&S launched hyper bullet coaster or a large new B&M, rather than a typical medium sized Premier launch. You wanna know what else V2 is? Old, unreliable, outdated, and a rather large eyesore as of recent years without paint. Most coasters can go around 10-12 years without a repaint, but with V2, we're coming up on Year 16 of original paint. Not only that, the electronics are outdated, the ride is plagued with downtime and mechanical problems(it gets stuck on the launch track almost daily), and is often closed for long periods of time throughout the season. I get why people like V2, I like it as well. But like most companies, Six Flags wants to make a profit. And if one of their coasters is getting to the point where it's not worth the operating costs, they're going to remove it. Yes, it's unique, but Six Flags doesn't really care about uniqueness(as can be seen with a lot of recent additions). They care about returning a profit, which I feel is something V2 is beginning to fail at. Wisco Woody wrote: I would just like to remind everyone exactly what V2 is and how many unique things it does compared to our other coasters. It is a launched, inverted, vertical shuttle coaster with 3 launches, the first being 0-60 in 3.5-4 seconds which is nothing to sneeze at. While Batman is also inverted and Superman achieves more sustained g force in the pretzel loop, no other coaster in the park, nor within a 200 mile radius, achieves anything else that V2 does in terms of elements. Just looking at the pitch/pull up to the vertical spires, those must be damn near the shortest radius of curvature, most extreme pull ups featured on nearly any coaster, and the contrast between the strong launch, strong vertical g force of the pull ups, and zero g free fall is a great experience. Some great insight here. You basically get "dragged" up that rear spike! I like V2, but if they have something better planned for that area I'm all for it coming down. As for the rapids, that's a great ride! They should never take that one out. V2's line was shockingly short during preview weekend. Is the GP catching on that it's a crap ride? I really like V2 one of my favorites. If it goes I hope it goes to St. Louis. That park needs something more then a carnival ride. Last edited by staticshadows on July 8th, 2017, 12:38 pm, edited 1 time in total. staticshadows wrote: V2 fits perfectly in The Penguin's Blizzard River location at SFA and will look great there. But the trains on backwards, paint it blue and call it Mr. Freeze Reverse Blast! Nah, I'm pretty sure La Ronde is going with a FreeSpin. I do agree that SFSTL, SFM, and SFOG will probably get the next wave of Free Spins, but I wouldn't completely rule one out for La Ronde. Free Spins are paired with Justice Leagues(JL's) and overall DC themes. La Ronde doesn't have and can't have DC themes. Thus, doubtful they are getting a Free Spin. I doubt that there is some sort of edict that Six Flags' Free Spins must be themed to a DC Property. 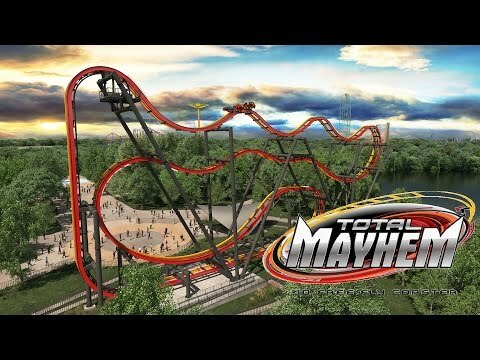 SFGAdv announced their Free Fly as Total Mayhem before it was re-named. They can't at LaRonde . Is there a reason why la ronde can't use DC?